I like Safari on the Mac but there's some things it doesn't have so I use FireFox to plug those holes. A good example is that right now Safari doesn't have the rich text editor that Blogger uses to edit posts in wysiwyg format. The underlying rendering code in Safari is based on KHTML which is open source. It turns out that new builds are available here and what you get is a version of Safari that has new features. The app is called WebKit and it can co-exist on your Tiger system along side current Safari. It picks up all of your settings and bookmarks so it's an easy transition. They seem to build very frequently, often several times a day. I'm posting this with the Friday 23rd Feb build and it seems solid so far. You get a nice gold rimmed icon too. My MacBook wouldn't boot up on Monday. It also wouldn't boot off a Tiger install DVD. I figured it was dead. Luckily I have been backing up my Documents folder with rsync to an external drive on a daily basis, so I wasn't devastated. I found my proof of purchase and rang Apple Australia to get a case number for the inevitable return to a service centre. To my surprise they helped me out. The original DVD that comes with your mac has extra diagnostic stuff on it that update DVDs don't. Hold down the D key while booting to get to hardware diagnostics on that original disk. It takes some time to re-install everything and find all the application serial numbers I have so I'm looking at doing some sort of full disk backup in the future. For now I'm using the Apple Backup utility that you get with a .Mac subscription. It seems good so far for backing up my whole home directory. It's been reported in The Age that Telstra's Greg Winn thinks that Apple should not enter the mobile phone business. He's so wrong. I've experienced a series of mainstream expensive phones from Sony Ericsson, Motorolla, and Nokia. Aside from the basic functionality of making and taking calls, the extra "smart" stuff tends to be confusing to use, buggy and often slow. My current phone, a Nokia 6233, can be routinely crashed simply by forwarding an MMS. I'm no basic user, I want internet, bluetooth, MMS and email. Some of the things shown in the Apple iPhone launch, like easy conference calling are probably possible but I dare not attempt them. Current phone operating systems from Symbian, and Palm haven't scaled well up to the requirements of multi-threaded networking applications. Microsoft's Windows Mobile is looking pretty good these days (used to crash in earlier versions) but I hear the battery life is terrible on some devices. We desperately need operating systems on phones that are built for the internet, you can't go past unix in that department. Where are the Linux phones? Apple takes great care with user interface, iPods have amazing depth of functionality in them yet they seem so simple to use, the competition has transformed the portable digital player marketplace over the past few years, I hope the iPhone does the same for the phone business. I wonder what phone Greg Winn uses, and can he figure out how to set the APN for his MMS without going mad? I'm really interested in the next step for broadcast radio, called DRM. (Yes another DRM). Digital Radio Mondiale sends audio as a low bit rate AAC stream. At this stage there aren't many radio sets out there, and they're pretty expensive. An alternative for technical folks, like you and me, is to modify a radio to get the 455Khz intermediate frequency out and mix it down to a low (audio) frequency that can be decoded on a computer with software. (Find DREAM). I've ordered, and quickly received, a tiny mixer board that should do the trick. While it came with a circuit, they skipped the pinouts and I figured this might be handy for other too, so it's shown above. Note that I may well have this wrong at this point, I'll update this post if I find an error while getting it going. (1 update so far). Update: I pulled my FRG-100 apart, tapped the 455kHz IF, and have started to receive DRM transmissions. It's pretty bad at this stage as you can hear but I'm sure I can improve things with tweaking. The dream software is amazing and if you understand it I'm sure let's you really see what's going on. Here's a screenshot. Having just returned from this year's Wyong field day I'm all fired up to look at GNURadio. Notes on DRM with the Yaesu FRG-100: I took the suggestions from here and tapped VR1002 to get 455kHz. I didn't change out the filter and perhaps that's why I'm not having much luck. The waveform looks 10kHz wide though. My antenna is a 20m long wire across the back yard and in the evening it overloads the receiver, I now have an attenuator that I hope will help in that regard. Catching public transport is an important part of keeping up with my Podcast subscriptions. 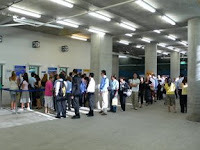 Normally it's pretty tolerable, but this morning, a Monday, the queues were crazy. This is Chatswood station. It's being upgraded at the moment so that explains some of the chaos. You can't see it clearly in the picture but there are two queues of perhaps a hundred people each, one at the window and the other at the automated ticket machine. Introduce contactless pre-paid cards, like the Hong Kong Octopus cards (from Western Australia I understand anyway). Of course, make the ticket gates take those contactless cards. Replace the bad ticket machines with ones that are easier to use and faster to operate. The current ones are terrible and also unreliable. Ban marketing people distributing their brochures at the narrowest part of the exit during peak hours. Consider having some all standing carriages for peak hours. I'm no expert but I do catch public transport and have experienced it in several countries. When I was young I used to build simple electronics circuits. Then I got a job as a technician, wielding a soldering iron every day. That killed the hobby for a long time. The fabulous Wyong Field day draws closer and each year at this time I get interested in radio and electronics again. While reading all the wireless news I stumbled across a local home brew group who have a contest to build an 80m AM transmitter. Great idea, pity it has to be at least 20W, that's a bit much for me. 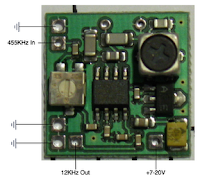 To see if I am capable of building something that makes RF, I thought I'd start really small and build a 4MHz crystal oscillator from a circuit here. Spent the $7 to get the bits, but how to construct the thing? My old mate Ralph builds lots of RF gear and he showed me a technique where you take printed circuit board and use a Dremel or similar electric grinding tool to cut insulating tracks in the copper. 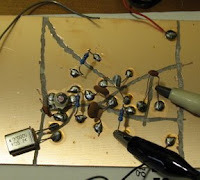 Then you solder the components across the tracks on the copper side. Did that, it worked! Update: It turns out this technique is one variant of Ugly Construction.